As part of our Clerkenwell showroom pop up between 13-31 May and the official Clerkenwell Design Week 2019 programme, the skinflint team is thrilled to be bringing together some special names in the art and design industry to host ‘Right to Repair’, a panel event exploring mending and restoration at 4.30pm on Tuesday 21 May. Design journalist Katie Treggiden will chair the event, bringing together V&A Artist in Residence and Hackey Repair Cafe volunteer Bridget Harvey, Crafts Council textile artist Celia Pym and skinflint co founder Chris Miller to discuss various issues around the theme of conscious consumerism. The subject is at the core of our ethos and even closer to our hearts here at skinflint, having spent the last decade salvaging and restoring thousands of original vintage lights that otherwise may have been lost forever, preserving their heritage and story for years to come. Expect passionate debates around the rise of repair cafes, the visible mending movement, the ‘right to repair’, designing for repair rather than planned obsolescence, and the layers of stories woven into designs each time they are restored. Please RSPV to secure your spot at the talk and after party which will take place at 4.30pm on Tuesday 21 May at our Clerkenwell vintage lighting pop up. Katie Treggiden is an award-winning design writer, commentator, editor, curator and lecturer with nearly 20 years’ experience in the creative industries, contributing to publications such as the Guardian, Elle Decoration, Design Milk and Crafts Magazine. Katie is currently studying for a Master’s in the History of Design at the University of Oxford. Based at the Camberwell College of Arts and Chelsea College of art, Bridget Harvey is a maker, curator and activist working at the intersection of craft, design, making and remaking. Bridget’s work with the V&A explores empowerment through choice and using the skills of repair-marking and collaborative working. Over the past twenty years Chris Miller has worked with some of the best names in the lighting industry, from Isometrix Lighting and Design and iGuzzini UK, to famed architects Foster + Partners and designer Philippe Starck. 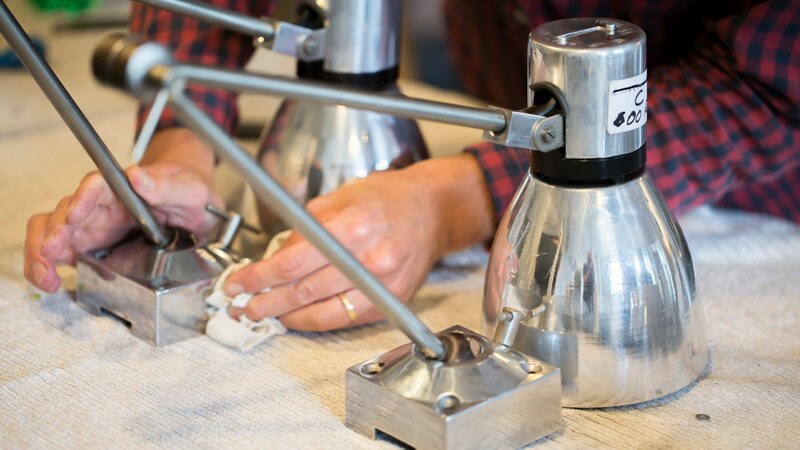 During the past ten as co founder of skinflint, alongside his wife Sophie, the couple have become experts in salvaging and restoring vintage lighting from across Europe. Celia Pym uses darning, knitting and embroidery to create intimate works that speak directly to human experience. Over the past ten years Pym has exhibited widely in the UK and beyond and has worked on a number of publicly engaged projects which aim to bring the value of mending to a wider audience. New and existing clients are invited to make a lighting consultation appointment with our team throughout our three-week pop up from 13-31 May with our team - please get in touch.